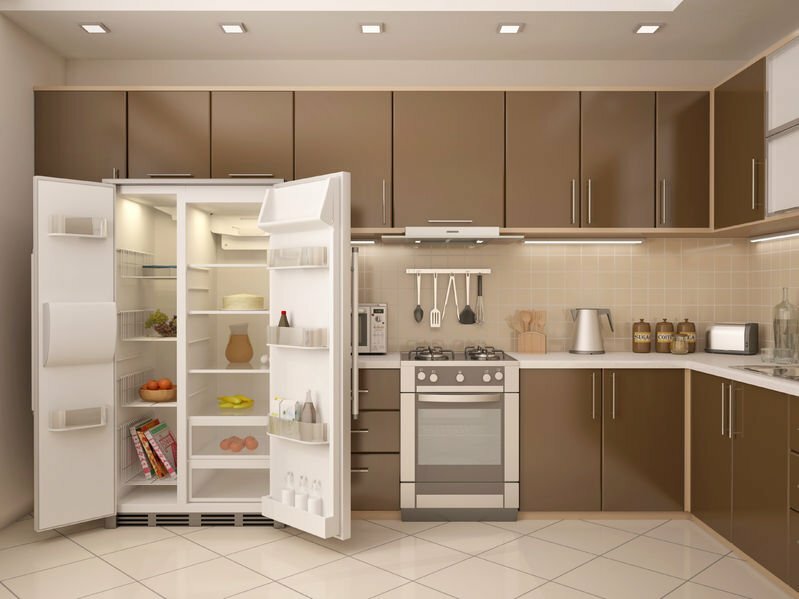 Refrigerators come in a wide variety of prices and a number of basic configurations, including bottom-freezer, top-freezer, and French door. Which you prefer depends upon your budget, space, taste, lifestyle, and storage needs. Check out below five of the most popular refrigerators of 2018, in a variety of styles and price points. There are few bells and whistles when it comes to General Electric’s budget-friendly, basic fridge, the GE model GTE18GMHES. It’s a top-freezer type with 17.5 cubic feet of capacity that manages to fit more than you’d think. It only has one temperature control, controlling both the freezer and the fridge temperature, but the big plus to this $800 refrigerator is its cool, sleek, slate-like, fingerprint-resistant exterior. It may be inexpensive, but it sure doesn’t look it. The Maytag 25 cubic foot model MFI2570FEZ is about twice the price of the above model, but it comes with a lot more than twice the perks. It has a built-in water and ice dispenser on the door, digital controls are on the outside, and the inside door shelves are adjustable enough to handle a one-gallon jug. It comes in sleek stainless steel as well. The Kenmore 72482 is a 29.9 cubic foot 4-door refrigerator that comes in a white or black finish. Its major advantage is what they call a “pantry door,” big enough to hold catering trays or a pizza box. The fridge, over all, is about as roomy as you can get at such a price. The only disadvantage: it doesn’t come in stainless steel. It’s inevitable that tech is going to take over the lowly refrigerator, and Samsung’s Family Hub refrigerator, model RF28M9580SG, might be the best of the new prototypes. It has three internal cameras so, when you’re in the grocery store and you don’t remember what you need, you can log into an app and peruse the inside of your fridge to see if the milk is running out. It also has a wifi touchscreen that can be used as a notepad to scribble messages or as a calendar. Finally, its two freezer compartments are set up so that you can switch one to refrigerator temperatures if you need the extra storage. If you want to kick your kitchen into the next tax bracket, check out the Samsung Chef Collection model# RF34H9960S4. This is another four-door refrigerator, with a whopping 34 cubic feet of storage, in which one of the freezer compartments has a temperature adjustment that includes “chill mode.” Inside the fridge there are “chef pans” that you can slip in under the shelves for marinating meats. The whole refrigerator is sleek and elegant, with recessed handles, and pinhole LED display of the temperatures in each section.